With the UTLD 100 firmly behind me, the only thing left to do at the beginning of August was to pack up the camper van and head off with the family for our long awaited tour of France and Italy. Quite by chance (!) our route took us through some of the best mountainous areas in Europe and we felt it would be rude not to run some of the trails we passed by. We travelled south to the Verdon Gorge, on to Antibes, then Tuscany, Rome, and back up to Courmeyer, Chamonix, Annecy and home. The knee held up and I took the opportunity to run in the hills, without a plan, without a target, just running, walking and enjoying. At 9am on Saturday 1st September, I was back in Cardiff and poised ready to sign up for the UTLD 100, Round 2. So I'm in again. Time for a second attempt and the training year starts here. I've been busy planning out my year, booking in events and training sessions that will take me through the year and build me up in time for July 2013. I've updated my events page with the new schedule. 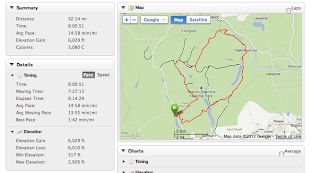 My first organised event was this Saturday - The Brecon Mountain Trail Challenge. 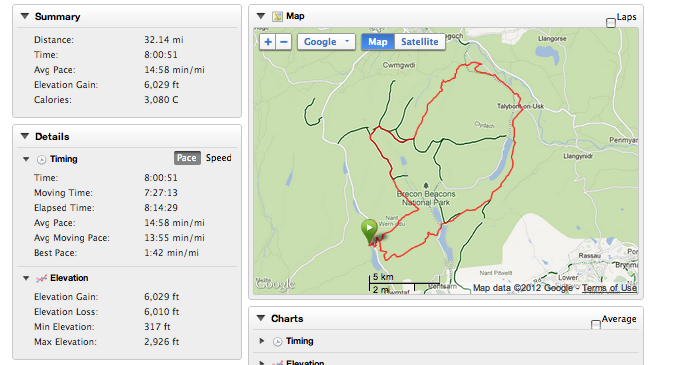 32 miles over the Brecon Beacons with 6000 foot of ascent. A good test to get a feel for where I'm at. I love my local events. They are relaxed and full of enthusiastic, interesting people. The Brecon Mountian Trail is mainly a walkers event, but there are always a handful of runners slogging it out at the front. It was great to spend time running and chatting with new friends. Al Davies and Tracey Edwards - it was fantastic running with you both. Thanks for your company and support. I also ran the first few miles with a fellow UTLD 50 finisher, Nigel, who I think was Nigel 'Jonah' Jones - I've read his posts on the L100 facebook site...some photo's below. The outcome of this first test?....thank god I've got another 10 months to train! I managed to maintain an average of 4 mph, so completed in 8 hours which was what I was aiming for, but I found the course quite tough. Why does climbing hills not get easier for me? Old ladies with shopping trolleys passed me on the steep climb up Fan y Big, but I guess this gives me a focus. Next up...I've got a training weekend planned in October that I am really looking forward to. I'll be joined by the wonderful Annie Garcia who I ran with for much of the first 60 miles of the UTLD, and my friend Sarah Warner who also completed the UTLD 50 this year too. We'll be running Ambleside to Wasdale Head on day 1, then on from Wasdale to Keswick on day 2. Can't wait!